The flute is the smallest and highest pitched beginning band instrument. It is a member of the woodwind family even though it is made of metal and doesnt use a reed to create the sound. In order to produce a tone on the flute, the player blows across the tone hole of the mouthpiece, allowing the air to split at the far edge of the hole. That creates a whistle sound. It uses the same principle as a whistle or blowing across a soda bottle. In all cases the air splits to create a sound. Aiming a thin air stream at the edge of the hole to make a sound can be a bit challenging at first but it gets much easier with time and practice. Since the flute is so small, its easy to carry around and easy to lose. As with all instruments, the flute requires a minute of assembly time and a couple of minutes to clean and put it away. There are several types of flutes but the beginning (soprano) flute is by far the most popular. Other versions of flutes include open hole flutes which are much more expensive and not suitable for beginners. Serious high school students and virtually all professional flautists use open hole flutes. 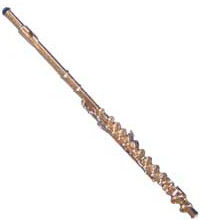 As with other instruments, there are several sizes of flutes available. None of the alternate sizes are appropriate for beginners. Advanced flute players tend to perform on the standard soprano flute as their primary instrument but they may also specialize in the piccolo or one of the larger flutes as an alternate instrument. The piccolo is a smaller version of the flute and is popular in band and orchestras. Other sizes include the alto and bass flute. These larger instruments are quite rare and only used in special circumstances. The flute is one of the more popular instrument which means its also more competitive. The good news is that the flute is used in many different musical genres, a flautist has the opportunity to perform in bands, symphony orchestras, some jazz groups and small instrumental groups. The flute also works well as a solo instrument. Another plus for the flute is the ample choices available to purchase or rent. As with all instruments, there are brands to avoid but there are many more companies that make an excellent beginning flute. Giardinelli sells a very popular instrument, the Gemeinhardt 2SP. Purchasing a used flute can be a good option if you know an advanced flautist or band director who can test it for you. The keys on a flute are very sensitive and prone to go out of alignment. The pads that cover the holes can also be damaged and need replacing. Flutes can be repaired but a good price on a used flute plus the price of repair can cost more than the price of a new instrument, so be sure to have a used instrument tested by an advanced player before you buy it.